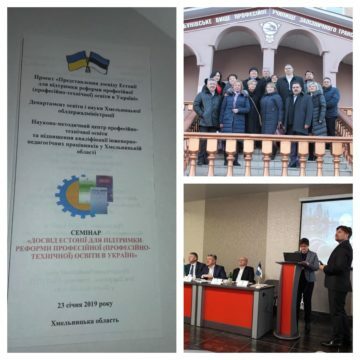 In the framework of Innove`s cooperation project “Sharing Estonia’s Experience in Support of Ukrainian Vocational Education Reforms” seminars for local educational experts were held on January 21-23 in Khmelnitsky and Rivne oblasts of Ukraine. The aim of the project is to contribute to the development of vocational education in Ukraine. Educational leaders of both regions, the heads of vocational schools, the representatives of the Ministry of Education and the Institute for the Development of Vocational Education took part in the seminars. Experts from Innove Katri Targama and Kaie Piiskop, as well as representatives of professional education institutions of Estonia Hannes Mets, Marika Šadeiko and Raul Ammer, shared Estonia’s experience in reforming vocational education, analyzed the situation of vocational training in Ukraine and visited vocational schools.